WHY ORGANIC COCONUT SUGAR ? 04 OctComments are off for this post. How is Organic Coconut Sugar Made ? 03 OctComments are off for this post. Follow us on Instagram for two weekly recipe videos! 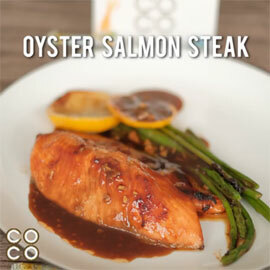 Marinate the salmon with the mixture of oyster sauce, Coco Sugar®, and chopped garlic. Put in the plastic bag, and marinate in refrigerator for about 1 hour. Put olive oil in the searing pan, bring to medium-to-high heat, and put the salmon (skin side down first), along with the lemon slices and asparagus. Season the asparagus and lemon with salt and pepper. Flip the salmon after 3 minutes, and finish the cooking process. In the other pan, heat up the left over marinate, then add the water and lemon juice. Reduce until it's thickened. Pour the sauce to the salmon. Preheat the oven 425°F (or about 218°C). Beat the chicken so it's slightly flattened. Then cut into strips. Combine the salt, pepper, paprika powder, and pinch of oregano into the desiccated coconut. 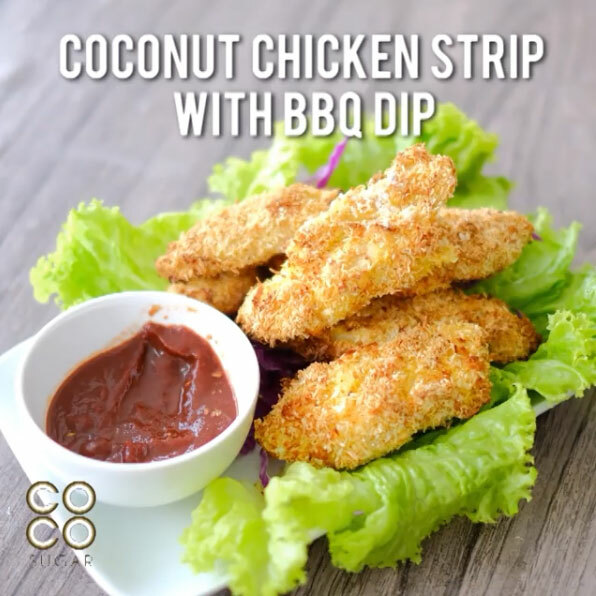 Coat the chicken strips in the beaten egg, then coat with all purpose flour, back to egg, then into the the desiccated coconut. Bake the chicken in 425°F (about 218°C) for about 20 minutes. For the BBQ dipping sauce: combine all the dipping sauce ingredient together, then bring to medium heat to stick them all together. Made From 100% Pure Organic Unrefined Coconut Flower Blossom Nectar. © 2018 PT. Coco Sugar Indonesia. All right reserved.